I customise fashion dolls & have recebtly become entranced by the looks of the miko, geisha & oiran. It's a whole new world to me & I'm on a steep learning curve, but I've picked up a fair bit of knowledge already. 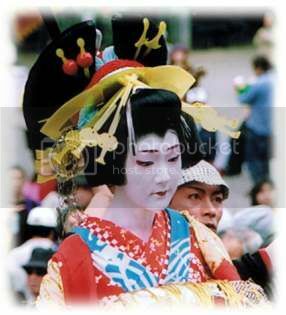 I'd eventually like to do an oiran doll & have found the 1/6 scale kanzashi, will be able to make the Koma-geta with molds & resin, picking up books on styling hair...the only thing I've not found is information on their kimono & way of dressing - are there specific styles excusive to the oiran? I know the obi is worn in the front, but I have no idea of how it's folded/tied. At the moment, I'm not looking to recreate a tayuu in 1/6 scale, as I've no idea how I'd do their kanzashi in small scale. Also, are there good places online for acquiring japanese kimono & obi fabrics? Obviously ebay is one...I've also looked at etsy.com, fabrictales.com & ichiroya.com - are there others? I've been to japantown here in SF, but haven't found much...just one store that sells kimono & has a very small selection of fabrics for dolls. Lastly, what's the best book for tsunami-kanzashi? Hi, welcome! Dolls are so much fun to make, and I hope you show some pictures! I would search for "kimono fabric" on ebay...you can get some beautiful bolts of fabric as well as reasonably sized scraps that a lot of quilters pick up. Once you know the types of kimono you will learn the different qualities and textures of the fabrics that make them. EDIT: btw, if you want some incredible inspiration, check out the film "Sakuran". It's not "traditional" tayuu colors or styles, but the fabrics and textures just blow your mind. a makura is a pillow like object with strings that is used to prop up a obi musubi (tying technique). Im on the hunt for my pics of the layers. edit found pics! http://flickr.com/photos/ajpscs/2424784065/ Back of bottom. I first thought that might be the collar of a kimono underneath the top one, but I have seen so many pictures where you could clearly see that it's not the case. I have never seen this on a normal kimono, except Edo-kimono with black collar. So this collar thing is for orian/tayuu only? They are wearing dounuki kimono under their uchikake. The collar, hem, okumi and part of the sleeve are different fabric from the rest of the kimono. See this thread and this photo. 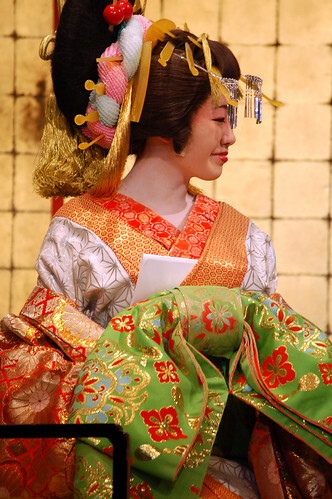 A dounuki is a kimono worn under the main kimono, over the juban. It is designed to show an extra layer at the collar, sleeves and hem. Usually they are part of a set with the outer kimono, but lone ones also turn up for sale. In this case, the outer layer was probably lost at some point, or wore out. Sometimes dounuki seem to be recycled garments that were assembled from odds and ends, not originally part of a tailored set. Confusingly, juban were sometimes made in dounuki style, but most dounuki are not juban. Naomi-san wears a fabulous Taisho era dounuki & kimono set in this thread. Knowledge Bank to the rescue! ↳ Who is this Geisha, Maiko, Tayuu, etc. ?